FDP Forum / Miscellaneous and Non-Fender Topics / Tell me about Reverend guitars. I found one today in a local pawn shop. Unable to identify the model number but it had 2 pups that are similar to Gretsch filtertrons or close to that. Bolt on neck. 3 knobs. Can't remember if neck is rosewood or maple. The closest I found online would be a Descent W but this guitar is not a baritone. The price for this guitar is so low, it was very tempting. Chime in if you know anything about them. They are fantastic and totally giggable right out of the gate. The originals (years ago) were made in the US. All subsequent ones are made in Korea, sent to Reverend USA, where final tweaks and setup are done, mostly by Zach (who's been doing it for years). Quality of workmanship and components is very good. I have three Reverends (a Hinson sig, a Volcano H90, and a prototype of the Vito sig). All three are fantastic; easy to play, and great tones all around. Thanks P. I may go pick this one up in the morning. It would be a steal for the prices I see online. This particular guitar has "Z"'s initials on the back of the headstock. 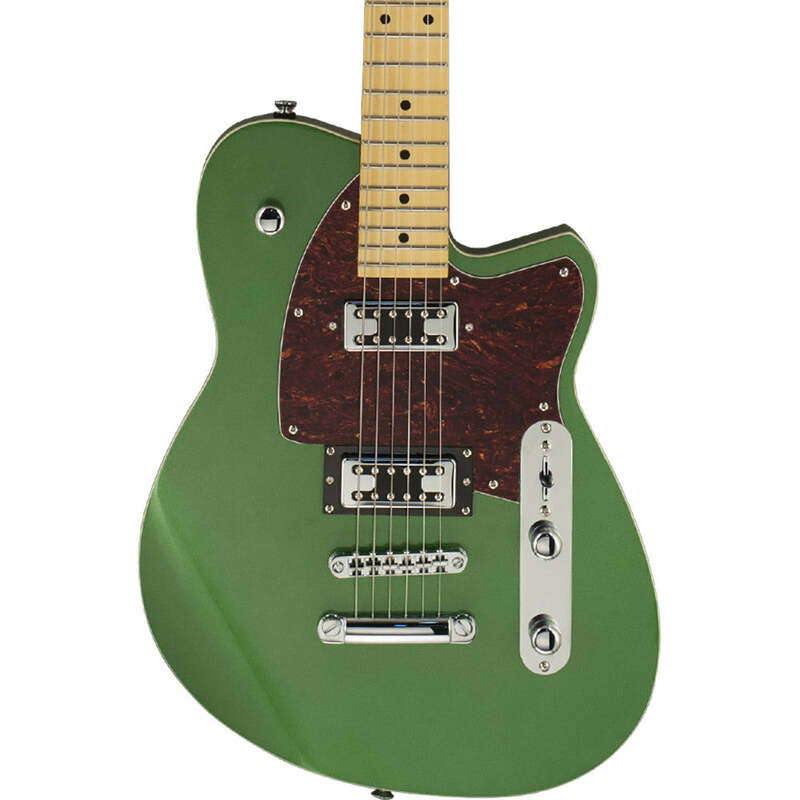 Odd that I cannot find this exact guitar anywhere online and on Reverend's website. Greg Koch uses them. All I need to know. It may be an early one! I think it is a pale light green. Pretty much has no wear on it. I have an engine turn slingshot custom. People just stare at it and think it’s weird. It plays well and sound great. 3 p90s in a Strat switching scheme . It covers a lot of ground. But it’s not either a Strat or a Les Paul type of sound. It’s thinner than one and thicker than the other. It’s never muddy and it’s easy to dial in what you want. The non releived plastic and aluminum body takes some getting used to. It’s the American made model and weighs nothing. Peegoo, it is a Flatroc. I called Reverend Guitars this morning and my guitar is a 2006 model Flatroc. My controls are not like a Tele but has 3 knobs and a switch on a tortoise shell pickguard. Bridge is like a Les Paul. Oh, I did buy the guitar this morning. My guitar is in great condition with the only wear showing on the pickguard screw. (A little rust) but not bad. Guitar sounds great but needs new string which I will take care of. It came with a tweed Fender case. They have been very lefty friendly. There will be one in my future. It has a master volume, master tone, and a bass contour. The bass contour control on these is a supremely useful feature. You can use it to dial the guitar from sparkly to ballsy in all pickup positions. This is a particularly good feature if you play through different amps because you can adjust the guitar to accommodate the amp's tonal center and get the sound you want. BbendFender, really good score, and that's not even knowing the price! I have 5 Reverends- A Flatroc like yours (but with a Bigsby), a Double Agent, a Roundhouse, and two of the American made composite bodies- a Commando and a Slingshot. The Flatroc is my go to - holds tune very well, super comfortable neck,reasonable weight, and great tones. I'll be interested in hearing your take once you get some playing time in. 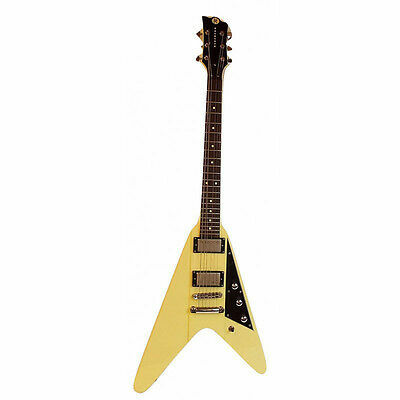 I’ve always wanted a V and Gibson is stingy with those for lefties. A Volcano would fill that bill in fine fashion. Shop around, because the Volcano has been issued with various headstock shapes. Get one you like! I got mine 2nd hand in pristine condition, for $400 with the Reverend OHSC. Very good score. I have a 2006 Club King, and I love it so much, it has supplanted my $2500 custom-built axe as my #1. I want one of those 3xP90 models next! I'm going to take it on my next country gig. Heck, all of my gigs are country. Not quite as bright as my Tele but this things feels great to my hands and it's not that heavy. Oh, it has Revtron pickups. Something new for me. I'll try to get a pic when I can. Very cool! Nice to find a really great guitar at a nice price. It gets the creative gravy bubblin' and inspires you to play more. And that is what we all want!